More than 160 festive music lovers attended a housebuilder-backed Christmas concert in Headcorn, raising nearly £2,000 for special causes. Seasonal notes were hit at ‘A Winter Concert with a Christmas Theme’, held at Headcorn Village Hall, supported by a £500 donation by Bovis Homes. 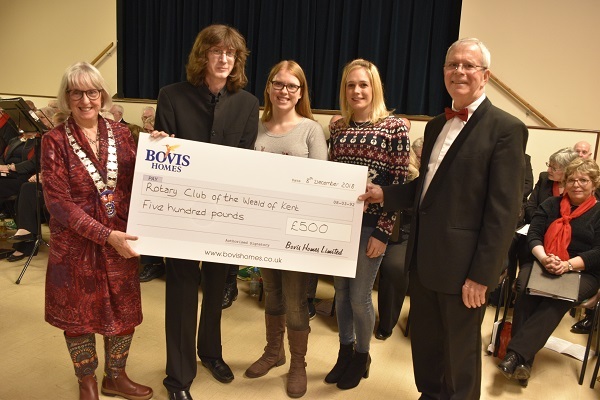 The concert, organised by the Rotary Club of the Weald of Kent, raised £1,837, almost double the event’s target, which will go towards local Rotary-backed community groups and charities. Bovis Homes is set to open its new Headcorn location, called Catkin Gardens, next year. Candice McCabe, regional marketing manager at Bovis Homes, said: “We are so proud to support this wonderful Christmas concert that has raised valuable money for such worthy causes in the Headcorn community. Ashford Invicta Singers charmed the family audience and helped the concert achieve well over its aim of raising £1,000. Candice was on hand to present Bovis Homes’ contribution to Rotary. Duncan Payne, from the club, said: “We are thrilled to have smashed our fundraising target for the concert, thanks to Bovis Homes. “The event has received some great feedback from the audience and shows how strong the community spirit is around Headcorn. The funds are being used to purchase a much-needed keyboard for Headcorn Patient Participation Group initiative, Singing for Health. The scheme explores the benefits of singing to people’s health and well-being. Donations will also be made to Headcorn Brownies and Five Acre Wood School, a local special school attended by children and young people with profound, severe and complex learning difficulties, including autistic spectrum disorder.